I am a member of the Collective Bias Social Fabric Community. This shop has been compensated as a part of a social shopper insights study for Collective Bias and their client. You know that store in the corner near your home, near your school..near your work that you run to every time when you need something? That store for me has been Duane Reade for years now. It was the store before I paid mind to what store it really was, I just knew it was the store I went to when I needed cards, beauty products, snacks, school supplies, to get my pictures developed, and more. It was the store before social media became what it is today, and now I follow my favorite go-to store Duane Reade on twitter where they have reached one million twitter followers! It's exciting to have been a follower from the beginning and to have seen the numbers grow. We celebrated by making a few shopping trips to all our favorite Duane Reade stores. Now thinking back Duane Reade was where many memories were created for me. I think back to that corner store in Woodside, Queens I remember walking in with my mom picking up something quick, then later on growing up buying my first beauty products. My mom passed away when I was a sophomore in high school, so any memories with her are truly treasured. I wish I could tell my mom how now I tweet with Duane Reade. Duane Reade is the store I went to when I was looking for snacks to keep me awake during crazy study hours, when I was a student in the city. Now my little boy who recently turned five loves Duane Reade and mentions it by name when we need something, or when he wants an excuse to go so he can visit the toy section. The store I turn to for school supplies as I prepped up for our first official year of homeschooling. 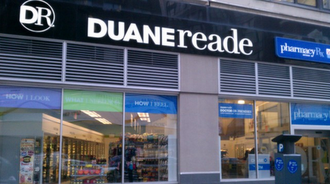 As a blogger I've enjoyed sharing my shopping experiences with you all, and witnessing Duane Reade grow on Twitter. Duane Reade stores themselves have been getting renovations, and it's all so exciting to be have been a shopper from the beginning. I love Duane Reade for always having what we need, and then some but most of all always having convenient locations all over New York City. It's fun because now you can become one of the one million followers on Twitter, and follow them on all their other social media accounts, find them all out on their website. This year the most exciting app I have become dependent on has to be the Duane Reade app, I'm obsessed with ordering photos from my phone along with all it's other great features. Duane Reade thanks for always having all that we've needed over the years, and thanks for being so social - even with one million plus followers I love that you're a tweet away! Congratulations, here's to a million more!